1. 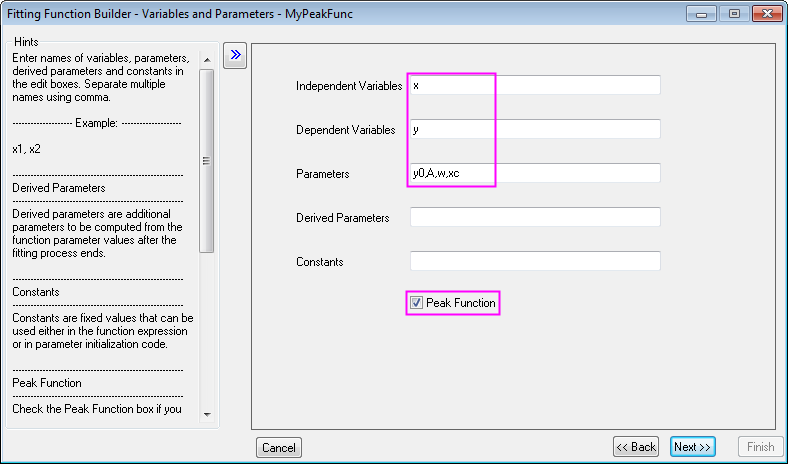 The defined peak function should be placed into PFW category and the Peak Function check box on The Variable and Parameter Page should be checked. 2. 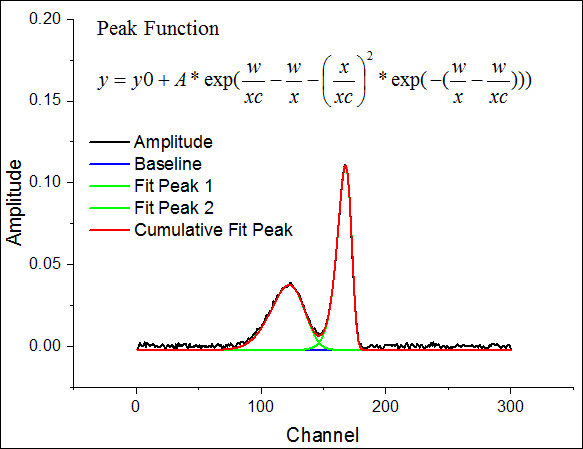 There should be at least four parameters in the defined peak function, that correspond to different peak characteristics, and assigned as attributes Offset/Baseline, Amplitude/Area, X Width, X Center. And the first parameter must be named y0 (Offset). We have put together an Origin Project (OPJ) User_Defined_Peak_Function.zip (5.8KB), you can download this OPJ file to learn how to defined a peak function and fit with it. 1. Hit F8 key or go to menu Tools: Fitting Function Builder to open Fitting Function Builder. 2. Click Next to go to Name and Type page, select PFW category from Select or create a Category drop-down list, input MyPeakFunc as Function name. 6. Click Finish button and the peak function is created and placed in PFW category. 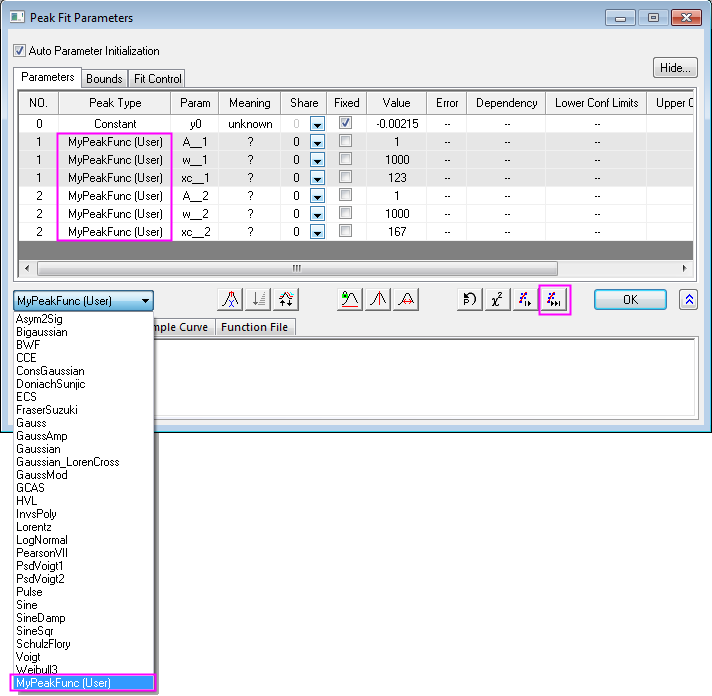 Tip: If you want to make existing fitting functions available for peak fitting, choose Tools: Fitting Function Organizer. Right click the function and choose Move to or Share to and select PFW as the drop-down list option in appeared dialog. Once you have defined your peak function and it is placed in PFW fitting function category, it is ready to be used for peak fitting. Now open User_Defined_Peak_Function.opj in zip file mentioned earlier, highlight column Amplitude (Long Name ) and go to menu Analysis: Peaks and Baseline: Peak Analyzer to open the wizard. 1. Select Fit Peaks(Pro) as Goal and click Next button 3 times to go to Find Peaks page. 2. Click Find button and three peaks are found. We need to remove x=120 peak since it is redundant. To do it uncheck Enable Auto Find checkbox and click Modify/Del button and hit Delete key in keyboard to remove that x=120 peak. Then click Done to close dialog. 3. Click Next button and you will find the peaks are automatically fitted (using Gaussian function by default), so we have to switch to our newly created peak function. To do so, click Fit Control button to bring up Peak Fit Parameters dialog. 4. 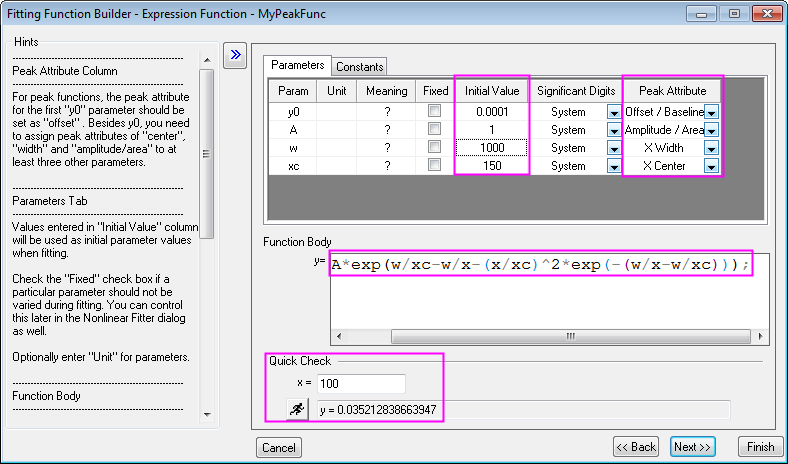 Select MyPeakFunc (User) from the drop-down list in middle left and the Peak Type in upper panel will automatically switch accordingly. Now click Fit Till Converge button to make the fitting and click OK to close the dialog. Note: To change peak function for a single peak, you can also click the corresponding function in Peak Type column and change it. 5. Click Finish button will output fitted results into a report.